just prior to the closing ceremony on the last day of the Games. This imposing ceremony, which recalled to us by its splendour the glorious days of ancient times has left in the minds of all those,who assisted in it, the most lively, the most lasting impressions. The gods, who presided over the weather were at last smiling on us ; the sun shone with brightness, and if there were some clouds hovering in the sky, they merely afforded an agreable shelter from the burning rays of the sun. Of course the Stadion was invaded by a crowd already in the early morning. By ten o'clock it was as well filled with spectators as on the day of the Marathon Race and presented pretty much the same animated aspect. At half past ten arrived the Royal Family, all its members were present, with the exception of the Queen, who unfortunately was still confined to her chamber. The King and his children were, as usual, received with full honours, and took their seats bowing acknowledgments. Mehemet All Pasha, an Egyptian Prince, brother of the Khedive, who had arrived the evening before at Athens was also present. After the entrance of the Royal Family, free access was given to the people outside the Stadion, and whoever could find either a seat, or merely standing room, was allowed to enter. So many persons availed themselves of this permission that the Stadion must have contained on this clay more than seventy thousand people. As soon as the King had taken his seat Mr Robertson, from Oxford University advanced towards him, and read an ode which he had composed for the occasion to celebrate the glory of the Olympic Games. In this ode written in Ancient Greek in Pindarian meter, the poet gave vent to the most noble sentiments, which only an ardent love and knowledge of Ancient Greece could have inspired him. The King lent a most attentive ear to the recital of those beautiful verses, and the audience cheered heartily when the poet had finished speaking. After having warmly congratulated Mr Robertson the King stepped on a sort of platform, erected before the Royal seats, and richly decorated with carpets and flags. On a small table were placed the olivebranches, to remind one of the ancient Altis, some laurel branches and the different diplomas, written on blue or white paper and folded up in long rolls. The medals, struck in silver for the first, and in bronze for the second prizes, were real masterpieces of workmanship ; the model being engraved by the celebrated artist Chaplain. On the table lay also the presents for the winners, amongst them were a rich silver cup, given by Mr Breal and an antique vase presented by Mr Lambros, both destined for the winner in the Marathon Race. Mr John Lambros had on this occasion addressed the following letter to the Crownprince. The distinction, which the Marathon Race is called upon to give to the Olympic Games, joined to the ancient reminiscences, which this difficult race is sure to awake, have suggested to me the idea of offering as a most appropriate prize to the winner, who will be worthy of so much glory, an ancient vase, which I have in my collection; on it are represented a dolichodrome under the guidance of Hellanodices. May I hope that Your Royal Highness will allow me to add this prize to the silver cup,which Professor Breal has given. Antiquity seems in this way to contribute to celebrate the victory of the winner of the Marathon Race. Behind the King stood the Crownprince and the members of the Council of Twelve and the General Secretary Mr Philemon. 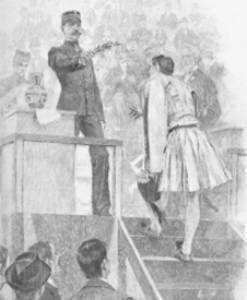 In front of the stand were drawn up in one line the Olympionic winners, wearing simple morning attire, conspicuous amongst them stood Louis, his slender figure dressed in a fustanella of spotless white. When he entered the Stadion, he had received a warm reception from all sides. Captain Hadjipetros R. A. who had undertaken the office of a herald for the occasion called with a loud voice the names of the winners. He mentioned at the same time the country of each and the contest in which he had distinguished himself. After each call the winner mounted the stand and bowing before the King, who had a few kind words to say to everyone, received the diploma, the prizemedal and the olive branch. The King shook hands with each winner, who after a respectful bow retired to make room for the next champion. Each competitor receibed of course an ovation from the assembled crowd. When the herald called out the name of Louis, and when the victor in the Marathon Race ascended the platform, the Stadion resounded with cheers which seemed to take no end. Pigeons adorned, with ribbons of the national colours of Greece, were let flying accross the Stadion; national flags and handkerchiefs were agitated in the air ; nobody can even attempt to describe the joy, the enthusiasm of the Greek people ; the foreign guests were not a little astonished by it. But the Hungarian, American and German prizewinners were not forgotten, they all received their full share of enthusiastic acclamations and cheers. After this followed the distribution of the second prizes. The King presented each winner with a bronze medal and a laurel branch. Some winners of first prizes in special contests received also some presents: Louis, a silver cup, given by Mr. Breal and an ancient vase presented by Mr J. Lambros ; Mr Gravelotte, a beautiful silver cup, given by the Athenian Club ; Mr Karassevdhas a gun, and Mr Phrangoudhis a pistol. The King presented also Mr Robertson with a laurel branch. The ceremony of the distribution of the prizes being over, Mr Gebhardt, representative at the Olympic Games in Athens for Germany, presented to the Crownprince a laurelwreath, tied with ribbons of the national colours of Germany and Greece. In offering the crown, Mr Gebhardt pronounced a warmly felt allocution which the Crownprince answered in German with a few appropriate words of thanks. After this came the procession of the champions, as it was the usual costum in ancient times. 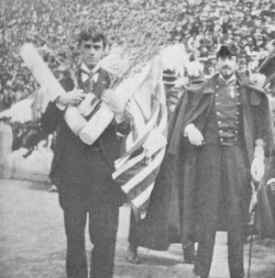 Headed by Mr. C. Manos, the director of the games, the winners of the first and second prizes carrying their olive or laurelbranches marched slowly round the course to the sound of a triumphal march. Louis walked in the first line, he seemed very proud and very much touched with so many tokens of honour showered on him. He waved incessantly a small Greek flag as if he wanted to express by doing this, his thanks and acknowledgments. When the «cortege» had made the whole circuit of the track and arrived again in front of the Royal seats, the King rose again and said in a loud and audible voice : «I announce hereby the closure of the First Olympiade.» The people answered by calling out : «Long live the Kings and everybody left theStadion. Soon afterwards quite spontaneously a large demonstration was held. A great number of people headed by the Council of Twelve and Mr Philemon, accompanied by various bands of music and the caretakers of theStadion, carrying the flags of the nations,who had been represented in the Olympic Games, marched to the Royal Palace, where they demanded to seethe Crown-prince. His Royal Highness appeared on the balcony with his two brothers. Prince George and Prince Nicolas, whereupon Mr Deligeorgi in the name of the Council of Twelve presented him with a laurelwreath, accompanying the gift with a few well chosen words. The Prince returned thanks and ended bis speech with the words : « Long live Greece.» Mr Orphanidhis spoke after this in the name of all the Olympic Champions and the Prince answered in appropriate terms. After this the procession marched before the office of the General Committee, where Mr C. Papamichalopoulos, deputy and member of a Commission to superintend the Athletic education of Greek youths, made a short speech, addressing Mr Vikelas, president of the International Committee for the Olympic Games, and Mr Philemon, General Secretary. After this the crowd dispersed. In the evening the illumination of the venerable ruins on the Acropolis seemed to symbolize the triumph of ancient institutions with the revival of the Olympic Games. The round of festivities was concluded by a farewell banquet, which the mayor and the municipality of Athens gave on the nextfollowing day at Kephissia to the foreign competitors. The invitations amounted to about one hundred and sixty ; amongst the guests, who honoured the banquet with their presence were the Crown prince, Prince George and Prince Nicolas, the ministers, the members of the various committees the foreign and Greek competitors, the representatives of the press etc. The mayor of Athens after having drunk to the health of the King, proposed a toast in honour of the Crownprince and of the Princes George and Nicolas, in which he mentioned the gratitude of the town of Athens for the generous help they had given, in order to bring about such a great undertaking as the revival of the Olympic Games. The Crownprince returned thanks. Mr Philemon toasted after this the government and Mr. Delyanni, ministre president, returned thanks in the name of the other ministers. Several other toasts followed, the most enthusiastically felt was certainly that of Mr Kemeny, representative of Hungary. The whole group of guests was afterwards photographed, and the banquet came to an end amidst signs of general rejoicings. 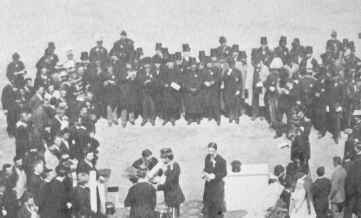 Prizes ceremony 1896 with the King. The thorough and unquestioned amateur spirit of the whole contest is most conspicuously shown in this case of Loues ; but besides this a charge made in one of the papers that a German, Schumann, who won the wrestling match, was a professional, was thoroughly sifted and disproved. The entire absence of betting also is another pleasant feature in which the games differed from many other athletic contests of the modern world. Athletics moved on a high plane, and were carried on with a dignity that ought not soon to be forgotten. The amateur spirit of the occasion was emphasized again at the final scene, the distribution of the prizes. Although the bestowal of a prize can never equal in interest the winning of it, still an enormous crowd had gathered in the Stadion on Wednesday morning after the disappointment of Tuesday. It was the gala day of the festival, with no anxious straining of mind or muscle, but pervaded by general gladness. The prizes looked very simple, the committee having decided to award no prizes of value. But there lay one prize which an Olympionikes might well covet, branches of wild olive, fresh from Olympia, to be given to each victor along with his medal and diploma. Those who had won two contests received two branches. When the king had given to each victor his prizes with fitting words and smiles, the crowd appropriated the remainder of the pile of branches. Every twig and every leaf was treasured up as a souvenir of the occasion. The Crown Prince had offered a silver cup to the victor with the discus. The king for a moment gave place to the Crown Princess, the sister of the Emperor of Germany, who presented this beautiful cup to Garrett. Loues also must needs have something more than the " corruptible crown." 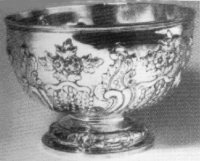 He received the magnificent silver cup given by the Frenchman Breal, as well as an ancient vase portraying a race, which he afterwards, with rare good sense, presented to the museum. The appearance of Loues was again the signal for the crowd to turn frantic with joy. Greek flags appeared everywhere, from the big one at the masthead to the little ones carried up into the air by numerous doves. Flags and flowers literally filled the air.